A perfect potluck salad, this Broccoli Quinoa Salad with Sesame Miso Dressing is a healthier version of traditional broccoli salad. 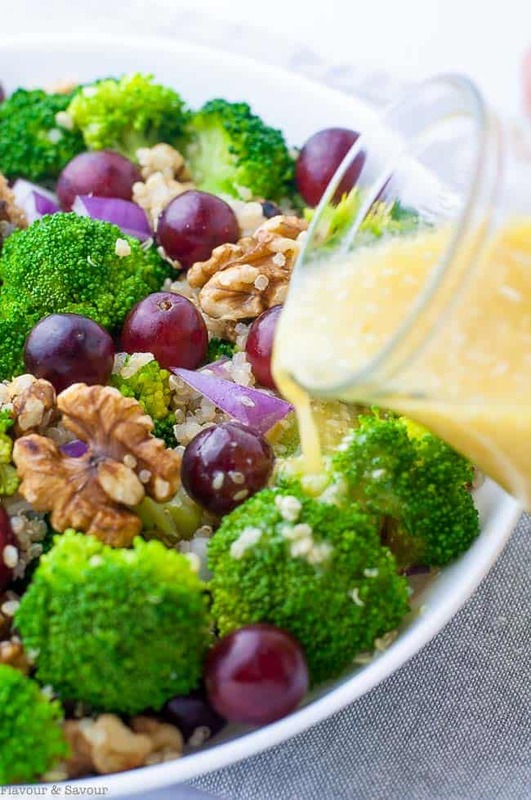 Made with nutritious quinoa, tender crisp broccoli, sweet red grapes and walnuts, it’s tossed with a to-die-for dressing. I don’t know about you, but the words Broccoli Quinoa Salad don’t make me salivate. It’s just broccoli, after all, and I know it’s good for me, but it’s not terribly exciting. But combine it with sweet red grapes, a few toasted walnuts and toss it all with a to-die-for Sesame Miso Dressing and I’m coming back for seconds! Broccoli Salad has been a staple at potlucks for more years than I can remember. 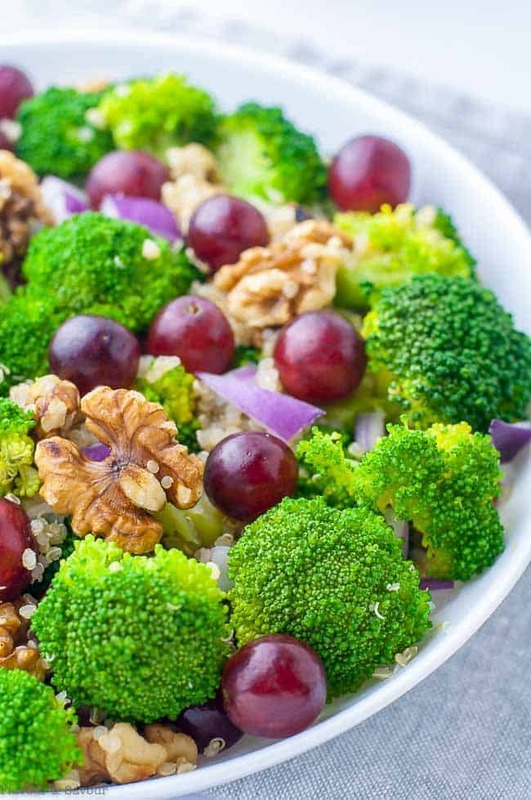 Broccoli florets combined with bacon bits, raisins, cheddar cheese and sunflower seeds and tossed with a mayonnaise-based dressing, it was a simple, make-ahead salad recipe that everyone loved. This Broccoli Quinoa Salad with Sesame Miso Dressing is also a simple, make-ahead salad, and it has a beautiful balance of sweet and savoury flavours. 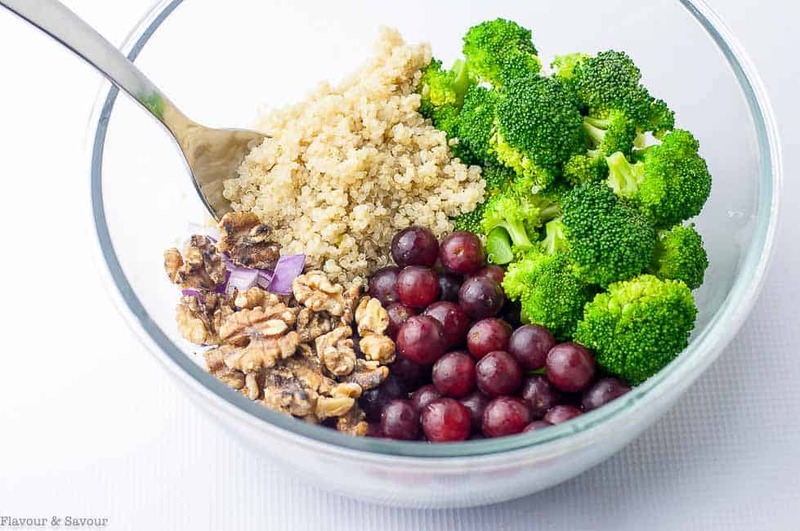 It’s a winning combo of nutritious quinoa, crunchy walnuts, tender crisp broccoli and sweet red grapes that pop in your mouth. Toss it with my favourite Sesame Miso Vinaigrette and you’ll have a satisfying meal in a bowl, minus the mayo! This is a good dinner salad, and it makes great leftovers for lunch the following day. Make a big salad, enjoy it for supper, then save some to pack in an airtight container for your lunch. It’s nutrient-rich, wholesome and filling–a totally satisfying salad for your clean-eating diet. But let’s talk about this Sesame Miso Vinaigrette. I’ve used it in several recipes, including Asparagus Salad with Smoked Salmon and this Fresh Veggie and Grilled Shrimp Zoodle Bowl. It’s flavours are bold enough to stand up to the broccoli, it’s thick enough to bind all the ingredients together, and it adds delicious umami flavour to this broccoli salad. Blanch the broccoli. Or leave it raw. Your choice. Some people have trouble digesting raw cruciferous vegetables like broccoli and cauliflower. Others claim that cooking destroys their cancer-fighting properties. If you do blanch it, don’t overcook it! Cook in or over boiling water just until it starts to turn bright green, remove and plunge into an ice bath (a bowl of ice water) immediately until completely cool. Then drain and pat dry before adding to the salad. It will be tender crisp and a brilliant green colour. If the grapes you have are large, slice them in half. To make fluffy quinoa, rinse measured dry quinoa in a fine-mesh strainer. Tip into a pot and add twice as much water. Cook, uncovered, until all the water is absorbed. Then remove from the heat, cover, and let it steam for 5 minutes. Uncover, fluff with a fork and let cool completely before adding to salad. You can spread it out on a baking tray to speed up the cooling. Ready to give broccoli another try? 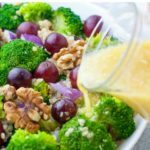 A perfect potluck salad, this Broccoli Quinoa Salad with Sesame Miso Dressing is a healthier version of traditional broccoli salad. 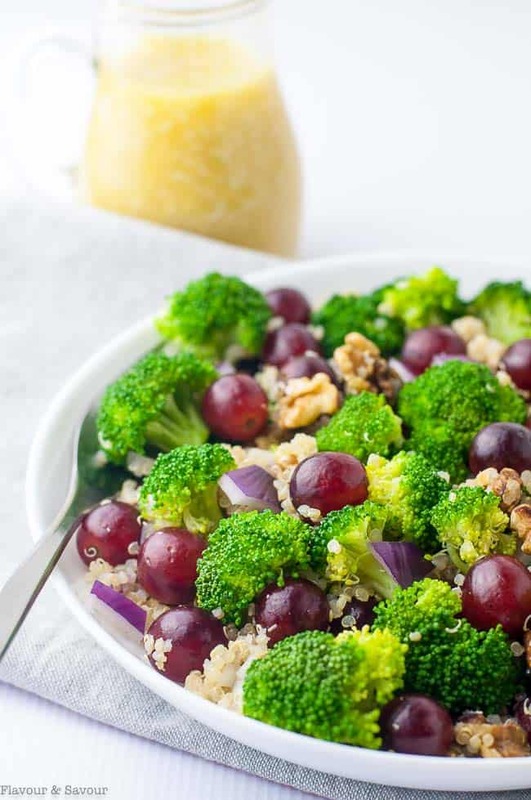 Made with nutritious quinoa, tender crisp broccoli, sweet red grapes and walnuts, it's tossed with a to-die-for sesame vinaigrette. Rinse quinoa in a fine-mesh strainer. Tip into a pot and add 1 cup water. Cook, uncovered, until all the water has been absorbed. Then remove from the heat, cover, and let it steam for 5 minutes. Uncover, fluff with a fork and let cool completely before adding to salad. You can spread it out on a baking tray to speed up the cooling. Add broccoli florets to a pot of boiling water for 1 to 2 minutes or just until they turn bright green. Do not overcook! Have a large bowl of ice water ready, and using a slotted spoon, quickly transfer broccoli to the ice bath to stop it from cooking. Drain on a tea towel or paper towel. Pat dry. 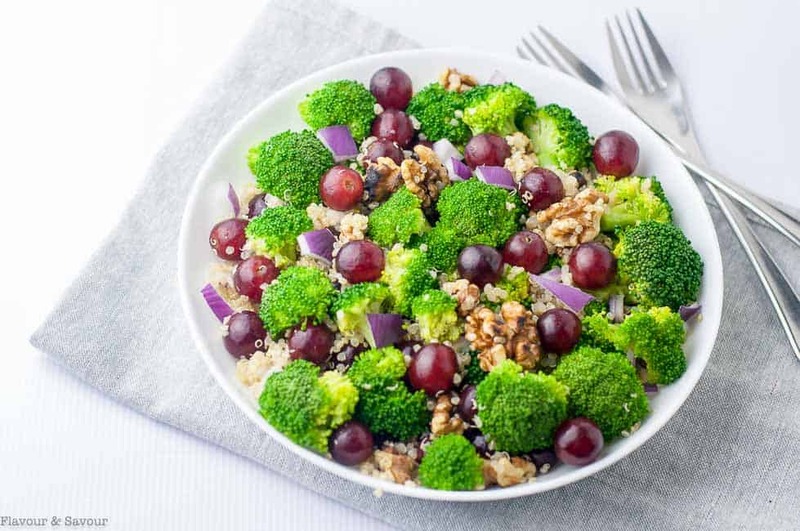 Combine blanched broccoli florets, grapes, red onion, and quinoa in a large bowl. Toss with Sesame Miso Dressing, garnish with coarsely chopped walnuts and serve. Toast sesame seeds in a small skillet over medium heat, shaking the pan frequently to prevent burning. When they just begin to darken and become fragrant, remove from heat immediately and transfer to a small plate to cool. In a small jar, whisk the remaining ingredients until well combined.Add the toasted sesame seeds and serve with salad. Note: These amounts will make twice as much as you will need for this salad. Store remainder in a jar in the fridge and enjoy over salads, roasted vegetables or grilled meats. Thanks Maria! 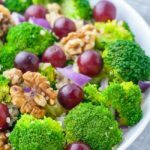 That makes me laugh–yes, broccoli isn’t the most exciting food on the planet, but we loved it in this salad! 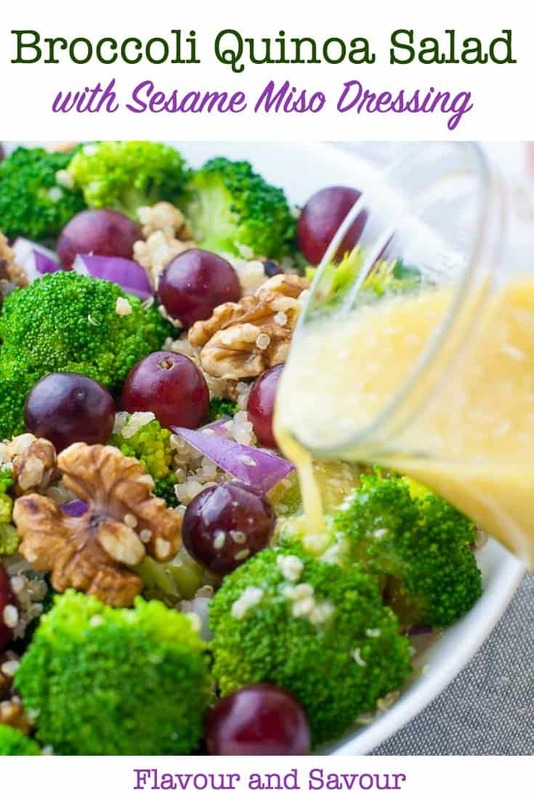 This is a great twist on broccoli salad! Love the grapes and quinoa, and I’m a huge fan of homemade dressings, so that sesame miso dressing is calling my name!! Hi Elaine. This salad shows up at every pot luck, but you have made it fresh and delicious with that sesame miso dressing. So much better than a mayo based dressing in every way. Love that dressing! I think I could eat it on anything lol!